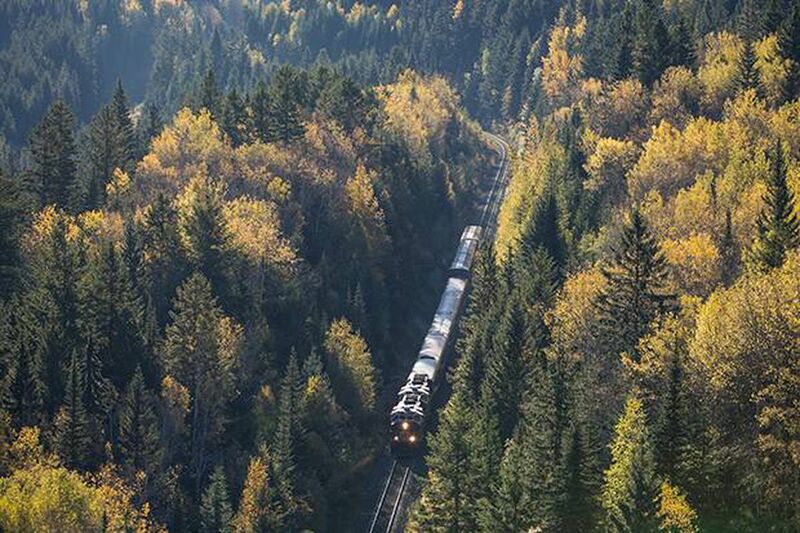 Luxury train travel is back in vogue and one Canadian railway is leading the way with a lineup of adventurous voyages. We were just sitting down to lunch when a couple of fellow travellers started shouting, "Bear! Bear!" From the safety of our train car we all rose out of our seats to catch a glimpse of a young black bear, who seemed entirely nonplussed as our Rocky Mountaineer train rolled past it and continued on through British Columbia's interior. The Rocky Mountaineer has perfected the art of slow travel; while on a journey, the only real requirement for a guest is to show up. Luggage transport, meals, transfers and activities are all taken care of so that travellers can focus on sitting back and enjoying the scenery. Since 1990, the company has shuttled passengers through western Canada, from Vancouver to points north and east, on nature-filled and historically important routes. My journey, First Passage to the West, took me from Vancouver to Lake Louise in Alberta, tracing part of the Canadian Pacific Railway line. This year, the company launches a culinary exploration that includes food-focused walking tours in Vancouver and Calgary, and an adventure-immersive itinerary with cycling in Vancouver, hiking in Jasper and canoeing on Lake Louise. It's not the only outfit seizing a renewed interest in train travel. In October, rail operator Golden Eagle Luxury Trains launches a 14-day Best of Britain Steam Tour, taking passengers through Scotland, Wales and England including private whisky distillery tours and black-tie dinners in historic castles. In Peru, this May, on the Belmond Andean Explorer's Picaflor sleeper train, the company is launching a spa car that will feature Peruvian-inspired treatments. When leisure is the priority, slow is the best way to go. Rocky Mountaineer itineraries start at $1,499/person based on double occupancy. For more information, visit rockymountaineer.com. Maryam Siddiqi travelled as a guest of Rocky Mountaineer. The company did not review or approve this article prior to publication.